Manager Ronnie McFall will urge Glentoran officials to appeal at least two of the red cards dished out to his players in Saturday’s controversial clash with Glenavon at the Oval. The East Belfast side finished with only EIGHT men on a day referee Keith Kennedy scattered cards like confetti! John Herron was first to go on 21 minutes following what must be said as a simple mistimed challenge on Mark Sykes. It was harsh on the midfielder. Calum Birney’s horrible lunge on the same player was more of an assault than a tackle. Sykes had already escaped a swipe from John McGuigan, but there was no chance of avoiding the defender’s scything challenge. It meant the Glens had to play the last hour with only NINE men. But the red cards kept on coming! Just minutes from the end, after Chris Gallagher clattered into Sykes, Glentoran’s Willie Garrett and Rhys Marshall of Glenavon got caught up in an off-the-ball brawl. Lisburn official Kennedy again had no hesitation. It looked so good for the Glens when Robbie McDaid headed home a great cross from McGuigan on 21 minutes. But it all went downhill when Herron departed 120 seconds later. 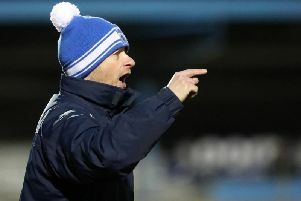 Glenavon levelled through Andy Hall early after the restart before teenage striker Jordan Jenkins pinched the points - which took Gary Hamilton’s boys to the top of the Danske Bank Premiership table . “We haven’t talked about appealing any of the decisions just yet, but it’s something we’ll have to think about, that’s for sure,” said McFall. “The Herron one was particularly hard to take. I didn’t think the first one as a booking at all – never mind a red card. I still don’t know how the referee came to that decision. “Even Sykes told the referee that Herron never touched him, but he wasn’t interested. Both players were looking to play the ball. “Birney’s was definitely a yellow card – no more than that. I didn’t think it was a straight red card. Yes, he took out the player, but it wasn’t one that was going to break his leg or do damage. McFall praised with the character and commitment of his team in such trying circumstances. “We were the better side before any of the sendings off,” he added. “They didn’t really create anything. “They put a lot of balls into the box without hurting us. I thought we deserved to be a goal up and, the way things were going, especially with the wind behind us in the second half, we would have went on to win the game. Glenavon boss Gary Hamilton believes his boys left Belfast with the points without being anywhere near their best. He said: “In my opinion, the first red card was never a sending off, but it gave us a numerical advantage that we didn’t use well enough. “I don’t think there was any arguments over the second one,it was a shocking tackle from Birney. “It was stupid to go into a challenge like that when you are down to 10 men. I had a go at the boys at half-time because we weren’t good enough in the first half, we didn’t move the ball quickly enough. “I thought we were a lot better in the second half – we got a lot of great balls into the box. We reverted to three at the back and I decided to bring on Jordan.